We are the New Zealand Walnut Industry Group and Walnuts Please is our web site. It’s all about enjoying New Zealand walnuts. NZWIG or BIG WIG (as we sometimes call our main committee) represents the majority of New Zealand’s commercial and lifestyle walnut growers and we have members from a far north as the Eastern Bay of Plenty to Wanaka in the South. We all enjoy trees, nature and growing walnuts. It takes up to 15 years before a New Zealand walnut orchard starts to produce enough nuts for a good financial return so it could be said that this is the ultimate in slow food. Time-wise the good thing is that the trees will produce for 120 years or more. Growers use grafted trees and plant them from about 6.5 metres to 12 meters apart. There is sometimes an additional tree planted in between that will be removed as the trees get bigger. Walnuts need free draining soil, a warm dry climate and irrigation in most situations. Relatively few chemicals are used because there are not many pests/diseases of walnuts in New Zealand and so growing walnuts here is kind to our environment. Click here for stories about individual growers and their orchards. Most of our orchards range in size from about 50 trees to 4500 trees. The New Zealand Walnut Industry Group inc. (NZWIG) was incorporated as a society in NZ in 2001. It grew out of the strong Tree Crops movement that started in the 1970’s and another group called Southern Nut Growers. NZWIG and people associated with growing walnuts in New Zealand have always been strong on research. The Walnut Action Group of the NZ Tree Crops Association established the foundations for our industry by collecting literally hundreds of walnuts from all over New Zealand and assessing their suitability for nut quality and productive growing. From this work some chosen varieties were grafted and have been used on most of our orchards. Rex and Meyric are two of the leading cultivars. Our research continues today with trial blocks from Wanganui to Wanaka. Canterbury is where most of our orchards have been established. NZWIG was incorporated as a society in NZ in 2001. The known history of walnuts dates back to 7000 B.C. (9000 years). The Romans called walnuts, “Jupiter’s royal acorn.” History indicates that English walnuts came from ancient Persia and so walnuts are often known as the “Persian Walnut.” They were traded along the Silk Road route between Asia and the Middle East, eventually spreading the popularity of the walnut around the world. English merchants ate them and carried them on their ships so they then became known as “English Walnuts.” Actually England never grew walnuts commercially on any meaningful scale. The latin or scientific name of these walnuts that we commonly eat is Juglans regia. There are other species that are not normally eaten. The outer shell provides a natural protective layer helping to preserve the quality of the nut and they were often carried by soldiers in ancient times. Walnuts were brought to New Zealand by English and French settlers. 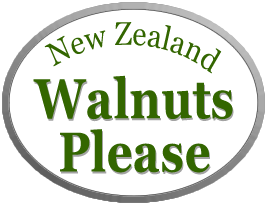 This web site is about New Zealand walnuts! One of the healthiest foods you'll ever enjoy. Walnuts Please is all about using walnuts but we also have another web site about producing them. Click through to our web site about growing walnuts.